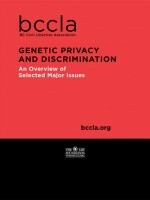 This paper briefly surveys the potential harms, including privacy violations and discrimination, flowing from several current and potential uses of genetic technology. It is beyond the paper’s scope to examine these issues in depth. That could easily warrant a major thesis for each issue. The goal instead is to highlight issues that may warrant more comprehensive research, legislation or policy change. The paper concludes with several recommendations governing forensic DNA analysis in criminal investigations and genetic testing in employment and insurance matters.